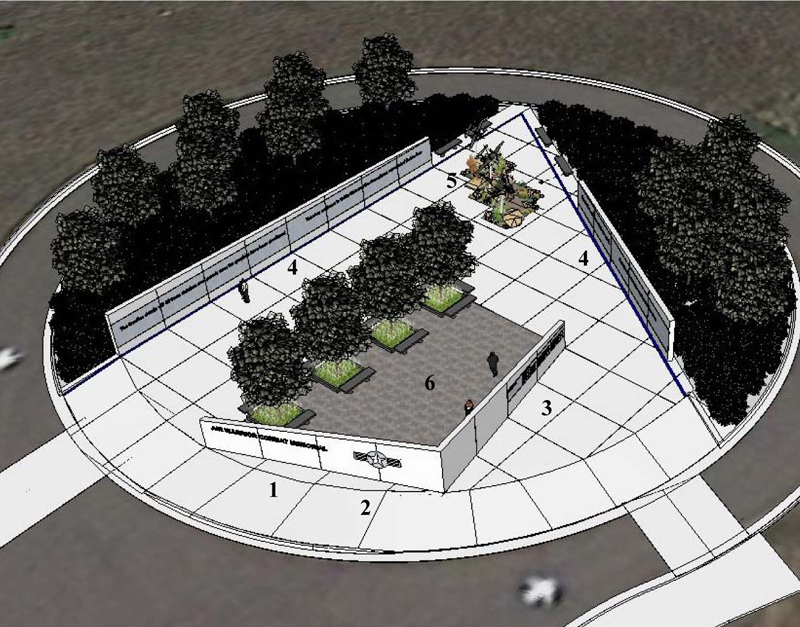 The Memorial will have two sculptural components: a life size bronze sculpture of General Robin Olds and three 1/6th scale bronze aircraft representing the aircraft Robin Olds flew in aerial combat: the P-51, P-38, and F-4. Due to recently established Academy memorial policy all figure sculpture located at the Academy must be life size. We have been authorized a sculpture at 6 ft 6 inches tall. · Three scale models cast in bronze of the three aircraft which Robin Olds flew in aerial victories. 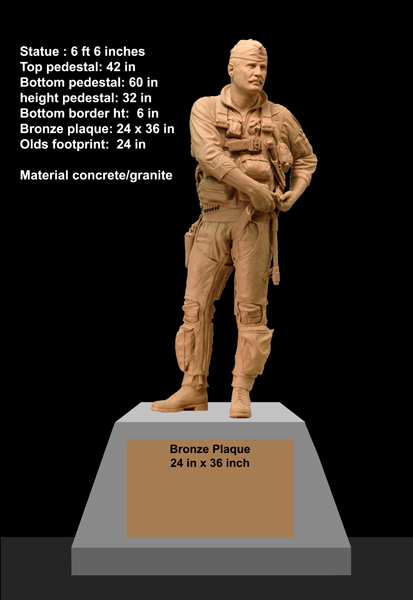 · Located within the plaza will be a 6 ft 6 inch foot tall bronze sculpture of Robin Olds who represents the spirit of the Air Warrior. · For best sunlight illuminating the face, the sculpture will face South. · The Olds sculpture will be standing on a pedestal measuring 32 inches tall and 5 feet square at the bottom. The sides will be beveled at a 30 degree angle.. The concrete walls will be oriented in two sets of angled wings, one on the outside of the plaza and one on the interior courtyard. 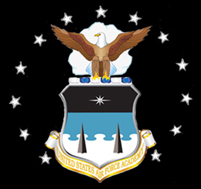 The etched timeline will become blue in 1959 to honor the "Long Blue Line"
· Three stainless steel poles will hold three bronze scale model aircraft representing the three aircraft Robin Olds flew in aerial combat victories. 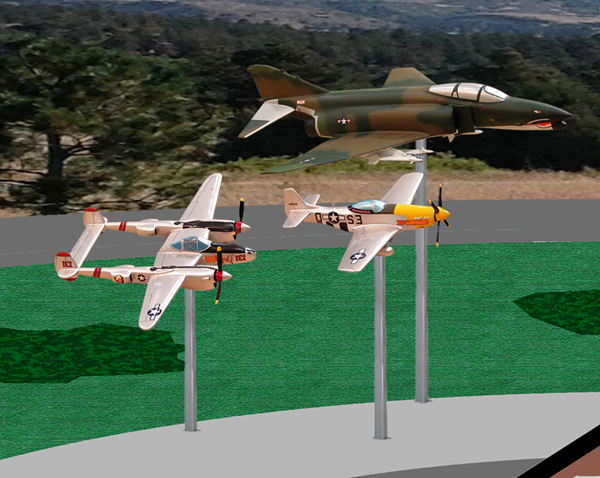 · Three plaques located on the center pedestal will describe each aircraft and detail the aerial victories by Robin Olds. · The 1/6 scale is optimal, too large they would overpower the statue, too small they will look insignificant like toys. 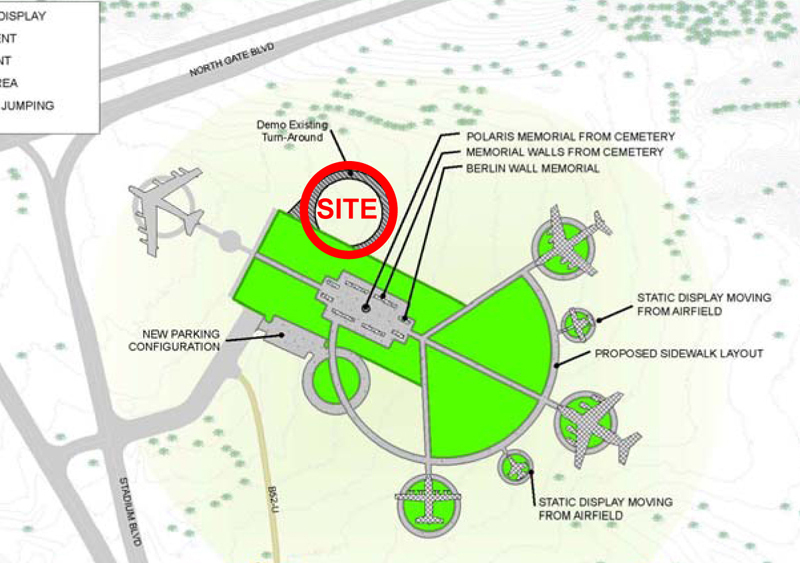 · The aircraft will be mounted flying in level flight with wings banked in a 45 degree as if rolling in on the memorial for a low pass. 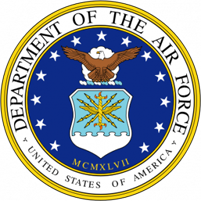 · These aircraft will add a degree of continuity to the B-52 airpark as well as provide a history lesson on the advances in air combat and how far we have come since WW2 in aircraft design. · It will also dramatically demonstrate how small the WW2 aircraft really were and give the viewer a new appreciation of what those past warriors faced. To honor Robin Olds and his contributions to Air Combat as a prime example of the warrior ethos. During our 40th reunion, we conducted a class meeting to discuss a class gift concept. 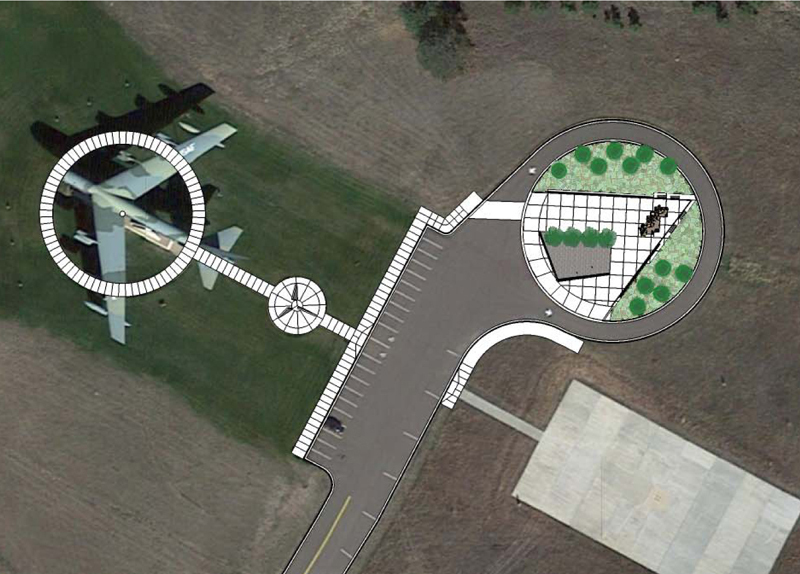 Two presentations were made for a monetary gift to the CCLD construction and for a sculptural monument centered around Robin Olds. 125 classmates attended the meeting and the vote to support both projects as a dual gift was 100%. Eventually, the project developed into the AWCM and Robin Olds became the representative who best represented the warrior ethos. During our campaign to locate the AWCM on the AOG Heritage Trail, we publicized our effort via a class website. As a result, we received strong support for both the AWCM design and for including Robin Olds, not only from the Class of 1971, but from hundreds of grads from other classes, as well as non-graduates. Many were offering donations. Approval rating ran at 90% for the hundreds of emails received by our committee and the AOG Board of Directors. 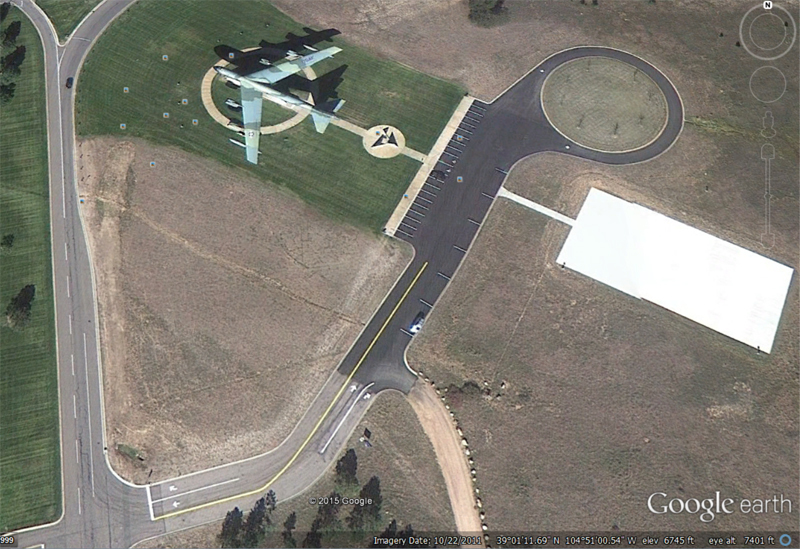 Most opposing views were limited to the issue of reserving the Heritage Trail for USAFA graduates. In acknowledgement of the graduate mandate, on December 10th 2013 the AOG BOD passed a resolution to support the Class of ’71 and their AWCM design, with Robin Olds, using all the resources available to the AOG, at a “more visible” location on the Academy other than the Heritage Trail, which is reserved solely for USAFA graduates. Robin Olds is well respected by a vast majority of USAFA graduates and Air Force personnel both active duty and retired. The synergistic effect of designing the AWCM and honoring Robin Olds, has struck a responsive chord within the graduate community and created a groundswell of enthusiasm. We expect the funding for the AWCM to proceed rapidly. Many pledges, both individual and keystone, have already been identified. A detailed description of the "Air Warrior" Sculpture is located at this menu selection "Warrior Sculpture"
A Pledge of support may be made at this Menu selection "Pledge / Contact"